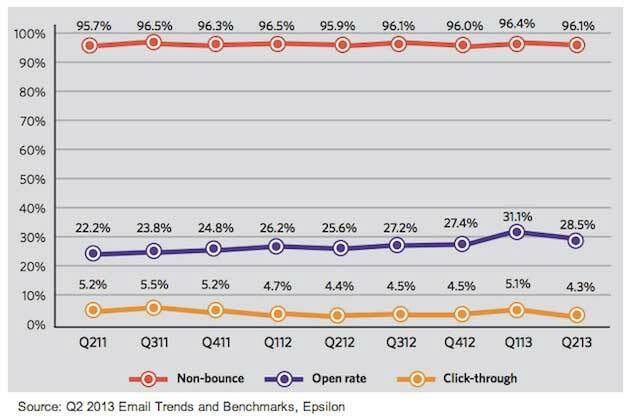 Email open rates decreased 8.3% in 2Q13 from 1Q13 levels, but increased 11.5% over the equivalent period in 2012, resulting in an overall average open rate of 28.5%, according to Epsilon's quarterly email trends and benchmark report. The average click rate in 2Q13 was 4.3%, down both quarter over quarter and year over year. However, the average non-bounce rate (the percentage of emails that were not returned as undelivered) remained strong at 96.1%.